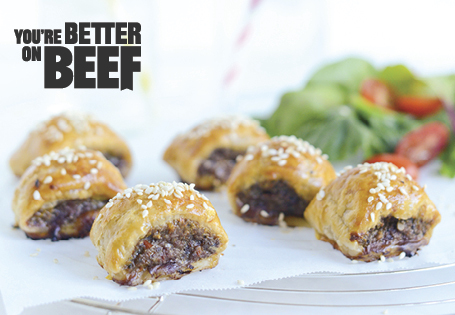 When they’re made with quality ingredients including lean beef mince and vegetables, sausage rolls can be an iron-rich, veggie-packed lunch box addition that is sure to get eaten and will aid energy levels and concentration in the classroom. If making your own breadcrumbs, place the bread in the bowl of a food processor and process until you have fine breadcrumbs. Place the beef mince, shallots, carrot, zucchini, mushrooms, parsley, breadcrumbs, tomato paste and Worcestershire sauce in a large bowl and mix well to combine. Place a sixth of the mixture onto a long edge of one of the pastry strips. Mould the mixture well, to form a long sausage. Brush the edges of the pastry with water and fold over to form a long roll. Cut each roll into 4 pieces. Repeat with the remaining mixture and pastry. Place the rolls onto a baking tray, brush with the beaten egg and sprinkle with the sesame seeds. Bake for 25-30 minutes or until golden brown. Can be eaten hot or cold. Tip 1: Place the cooked sausage rolls in the fridge immediately and use in lunch boxes within 1-2 days. Tip 2: Wrap the sausage rolls in cling wrap, in a reusable food pocket or container for lunch boxes and store with appropriate cool packs, to ensure the food is still fresh by lunchtime. Tip 3: The sausage rolls can be stored in the freezer for 1-2 months.